I’ve encountered a rather unexpected problem during my time in the online world. As I’ve made it a habit to review books as honestly as I possibly can, I have also, in parallel, gotten to know and really like people who have written books that I read. This can be nerve-wracking. I really want to like whatever my friends produce, but I don’t write reviews here so you can find out how awesome I think people are (well, not most of the time). I write book reviews to let you know if I think you should read this or that book. 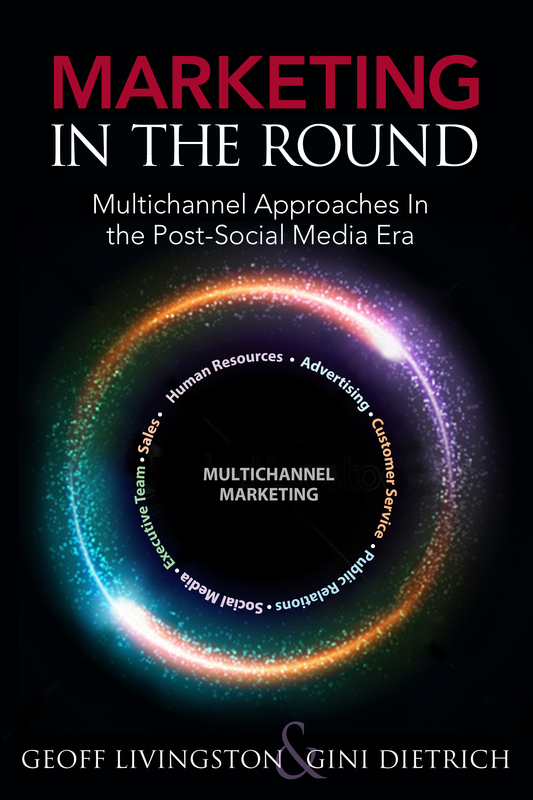 Luckily, in the case of Marketing in the Round, by Gini Dietrich and Geoff Livingston, I can simultaneously preserve my friendship with both authors while remaining 100% honest about how important I think it is that you read their book. Even though Geoff and Gini are both really well known in the online/social media world, this book is not a “social media book.” Rather, it’s a marketing book, and even beyond that, it’s a silo busting book. Geoff and Gini argue that after 9/11, as jobs were cut and people became much more worried about their jobs, these silos came back faster than mushrooms after a warm summer rain. People thought that by controlling their departments and the associated information, they could really get a leg up. Instead, this silo infusion actually broke the back of a lot of businesses. The scary thing is that a lot of companies might have a broken back today and yet be totally unaware of it. Marketing in the Round takes a chiropractor’s approach to this broken back problem. It snaps you back into place. 3. Marketing strategy – Direct, Groundswell, Top Down, Flank – This is perhaps the greatest strength of the book, as each type of marketing strategy is analyzed in tremendous detail, complete with pros and cons. For example, direct marketing is broken out into advertising, event marketing, email marketing, and social media with hefty analysis of each segment. This is continued for the other three approaches. 4. Measurement, Refinement, Improvement – Gini and Geoff provide a lot of detail about what to measure, how to measure, how to set objectives, and how to be willing to change your approach. They delve into more detail, again, than I have seen in other marketing books, down to how to create a dashboard using Excel. Ultimately, Marketing in the Round is a story about integration. It’s about how you need to integrate your departments so that everyone knows what everyone else is doing. It’s about integrating your objectives with the corporate objectives. It’s about integrating data so that everyone can work from the same information. And it’s about working with your external partners as seamlessly as possible. To put it another way, if you are in a business that needs to market a product or service, this book is a must read. Marketing in the Round touches on so many things you may find that you want to dig even deeper into one aspect before jumping into the next chapter. This is the kind of book that encourages you to work, not just read, so I would recommend the following if you really want to jumpstart your business. After you read the first part, give a gander to The Now Revolution by Jay Baer and Amber Naslund. They concentrate on the types of culture shifts that Geoff and Gini touch on – that whole, “Do you need to stimulate a crisis to create change” conundrum. As you read about the different marketing approaches, follow Geoff and Gini’s suggestion and check out Content Rules by CC Chapman and Ann Handley, particularly if you are new to creating content. That would be a great partner for a lot of the creative and copywriting information Marketing in the Round provides. As you read the final part treating measurement and management, check out Olivier Blanchard’s Social Media ROI, which touches on a lot of the integration issues Geoff and Gini talks about but also, per the name, delves more into measurement and what to do with the information you gather. As you read all of these books together, you’ll end up where Geoff and Gini take you at the end of their book – an understanding of how your entire marketing plan can be approved by your marketing round, integrated from types of marketing approach to specific details, and honed to meet your customers and prospects right where they are. And you’ll even be able to report to the c-suite on how all of this is going. Buy the book. Right here. And this is not an affiliate link. Then let me know what you think about it. I will pick it u. it might be awhile before I can get to it..there are so many other things to do with so little time to do it. I will move that to the top of the reading list. I agree with you Blanchard’s ( @thebrandbuilder )book was a good read. I will pick it up. it might be awhile before I can get to it..there are so many other things to do with so little time to do it. I will move that to the top of the reading list. I agree with you Blanchard’s ( @thebrandbuilder )book was a good read. Well done,MC! First of all, knowing how little time you had to read this, I am really impressed. Secondly, I’m glad you could preserve our friendship, too. BUT…even if you hated the book, we would need to hear that and we’d still be friends. I love what you took away from reading it and I love that you included the other books we suggested. Thanks so much, my friend! @JoelFortner I’ll be curious to hear YOUR review, Mr. Man! Thank you for your time and opinion, Margie! Your view of the sector is valued and needed! Fantastic! @margieclayman I stayed up late (too late) reading “Marketing in the Round” last night and would concur with your review. Not finished yet but definitely enjoying the read and recommending it to my networks. Nice job.